Now DNS recently enabled IPv6 on our primary nameservers. This was reasonably painless to configure using OVH and CentOS. Whilst IPv6 is not new, having been around since 1998, its adoption has been rather slow. After a few days usage we were pleasantly surprised to see reasonable amounts of DNS queries coming over IPv6. 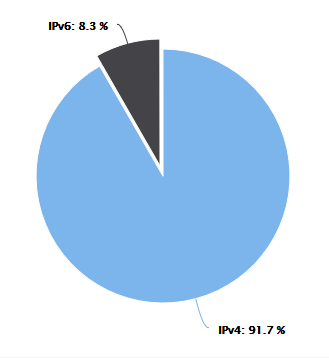 In fact we measured that slightly over 8% of queries are now using IPv6!